The continue button has been permanently broken after the online servers were taken down, rendering the game almost unplayable. For a fix, see NFS Pro Street Generic Fix. Patch 1.1 caps the frame rate at 30 FPS. To remove the cap, see NFS Pro Street Generic Fix. Latest patch can be found here. Download the right version for your edition. Patch 1.1 caps the frame rate at 30 FPS. Delete or rename attract_english_ntsc.vp6 and ea_bumper_english_ntsc.vp6. Up to 1920x1200 only. Use NFS Pro Street Generic Fix for automatic resolution detection and proper HUD scaling. Use NFS Pro Street Generic Fix. Available options vary between graphics cards. Only up to 4x is reliably available. Patch 1.1 caps the frame rate at 30 FPS. Origin version is not affected. Use NFS Pro Street Generic Fix to remove the cap. Download NFS Pro Street Generic Fix. Copy the contents to the installation folder. Change DisableMotionBlur = 0 to DisableMotionBlur = 1. Most in-race functions can be remapped. Menu mappings are unchangeable. Same range of remappable functions as for Keyboard. Supports sensitive triggers and analog sticks on Xbox 360 gamepads. They can be remapped so it's not needed. 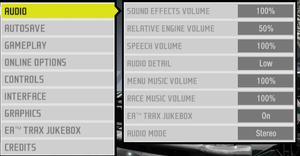 Sound Effect, Relative Engine, Speech, Menu Music and Race Music sliders available. "Surround" (Most likely 5.1 Channel) and Stereo options available. Files exist for subtitles in Cutscenes, but cannot be toggled on or off. 8 Added in patch 1.1. 8 The online mode was shut down before 2013. For dedicated install patch 1.1 and use Online\Launcher.exe. Deadzone can be adjusted in NFSProStreet.GenericFix.ini. 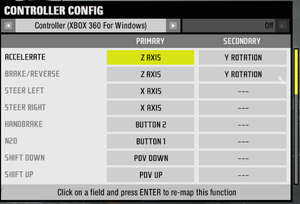 Download Input Deadzones for Controllers. Rename nfs.exe to anything else. Run the game using the renamed file. The game's input freezes randomly after finishing races. ↑ 3.0 3.1 3.2 VOGONS • View topic - Need For Speed ProStreet 30FPS screencap, can it be removed? All the crashes/freezes I had are gone. 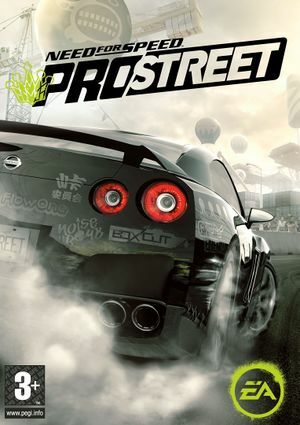 ↑ Need for speed pro street?